Gioconda has been practicing, teaching, and studying yoga for over 15 years. She is registered with Yoga Alliance and as an EYRT-500 and has led workshops, teacher trainings, and retreats, both nationally and internationally. In 2008 she initiated and co-founded the Austin based community movement “Changing The World, One Om at a Time,” a seva project designed to unite yoga communities in practice and service. A continual student, Gioconda completed her Master’s Degree in Spiritual Psychology and is working at the advanced level training in Somatic Experiencing. The blending of these skills, along with her years of exploration in the philosophies of yoga and principles of Ayurveda, provide the foundation on which she founded her private practice, where she assists clients to heal, grow, and explore their full potential. Gioconda combines alignment and flow to empower students to grow in their practice, inviting challenge in a nurturing environment. 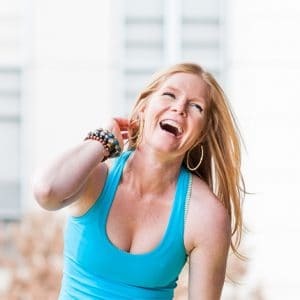 She encourages playfullness and enjoyment while exploring the science and art that is yoga. She believes passionately in yoga’s ability to bridge unity at an individual, community and global level. Learn more about Gioconda by visiting her website, facebook, twitter or instagram feeds.